Horse shows are games people play with their horses. Showing gives horse-minded folks a chance to socialize. You feel gratified when you head home with ribbons. But showing can be a stressful game for both horses and riders, especially if you are unprepared. Show veterans who load up their horses and head off to shows weekend after weekend establish routines for their show preparation, trailering, and schooling. Their horses become conditioned to traveling and working in new environments. Routine and repetition greatly reduce the stress of showing for both them and their horses. Those who show less frequently can minimize show day stresses with some thoughtful preparation at home. 1. Familiarize your horse at home to things they will encounter at the show. Horses are creatures of habit. The more the show environment reflects things they are familiar with at home, the more relaxed they can be. If you show infrequently, do not wait until the day of a show to ask your horse new questions. For example, if your horse has never heard a loudspeaker, try to borrow a bullhorn to simulate showground noises. Put up some flags, set up a mock judging stand next to your ring, and teach your horse to stand quietly at a gate until you ask him to move. If you only ride in an outdoor ring and the show will be indoors, take some lessons in an indoor ring to accustom your horse to the noises, smells, and feel of working indoors. Establish routines for grooming and tacking up that keep your horse relaxed at home then use them to help him stay relaxed in an unfamiliar environment. Take some of the stress out of showing by working harder at home than you will at the show. If you want to show at second or third level dressage, practice at third or fourth. If you want to show over 3' fences, practice over 3'6" or 4' fences at home. Then the show classes will seem easier for both you and your horse. As much as possible, practice at home in an indoor or outdoor space that is similar to the ring where you intend to show. At Meredith Manor, we ride in a 110' x 200' arena. When riders and horses are accustomed to riding in an arena this large, the corners in a dressage arena seem tight. So we mark off the correct dimension within the big arena so that they get the feel of riding the tighter corners or a three loop serpentine before the show. Has your horse worked with people hanging on the rail? Borrow some friends and ask them to be a distraction. 2. Pay attention to your horse to keep his attention on you. Learn to pay attention to your horse at home so you can gauge his mood and attention level at the show grounds. Learn what you need to do to keep the horse's attention on you rather than another horse or a flag or a loudspeaker. Practice 'heeding' from the ground to keep your horse's attention. When your horse 'heeds' from the ground, you will also have an easier time keeping his attention under saddle. Understand how to use rhythm to relax your horse if he becomes anxious under saddle. Understand how to keep your horse's attention by keeping him on your aids. Do not wait until the day of a show and hope you will figure it out on the spot. 3. Familiarize your horse with the show grounds prior to show time. Make things as easy for the horse as possible. If you are showing for a weekend, try to arrive the day before the show so that the horse has time to settle in. A long trailer haul is stressful and the horse is going to be tired. Give him a chance to rest. Then show him around. Heed him from the ground, or mount up and ride around. Know your horse well enough to know which is best for him. Walk around every arena, ask the horse to stand quietly awhile by the in gates, show him the concession stands, and ride past the judges stands. Then these things will not be new to him when it is time to show. 4. Manage your horse's excitement level during the test, don't wear him out prior to. I often see riders at shows longing their nervous or hyper horses for hours before their classes in the hope of calming the horse down by wearing him out. Then they wonder why their horse is too tired to put in a good performance. A better solution is to learn to ride the horse forward into your hand so you always have a connection with him. Without this connection it is difficult to have your horse on the aids or to use your aids to recreate rhythm and relaxation if your horse gets nervous. If you can keep your horse on your aids, you can get his attention when that loudspeaker blares just as you ride by. You can keep his attention and keep his excitement level down so he puts his energy into the test or class instead of into spooking. 5. Make checklists of the things you and the horse will need. Anxious riders make anxious horses. Just as routine helps horses stay calm, it helps riders, too. Create a routine for your show preparation. Make checklists of the things you will need and your horse will need. Use them when you pack to be sure nothing is left behind. For example, list the necessary paperwork your horse will need such as veterinary certificates, rabies and Coggins certificates, and registration papers. Riders need membership cards, entry forms, and rulebooks. Think through your horse's needs for feed, water, tack (include spares, too), first aids supplies, stable supplies like buckets and snaps, and grooming tools. Besides their show clothes, riders need water and food, too. They may like a chair to relax in and a mirror to primp. Talk to show veterans and create lists for day shows or overnight shows. Ask them what they will not leave home without, what they have forgotten and wished they had. Revise your packing lists after every show and customize them for your needs. It may help to remember that even top riders get the jitters, too. Many international-level riders work with sports psychologists to develop a winning mentality. They understand that if you are thinking about making mistakes, you will make mistakes. 6. Visualize your ride in advance. Walk the ring or course if possible. I like to visualize my ride in advance. When I am going to ride a particular dressage test, I visualize the test before I get on my horse. I 'see' the direction I will be traveling for each section of the test. If my brain throws in a mistake or a buck, I say 'no' then backup and ride that section successfully. I also use meditation to help me relax as I visualize which also helps me stay relaxed when I actually ride. If show rules allow you to walk the ring or a course before a class, take advantage of this opportunity. Practice relaxing and focusing before you get to the show grounds. Practice focus and concentration at home to the point where you can ignore everything else happening around you. Your brain can only be in one place at a time. If you are riding a dressage test that allows you to use a reader on the ground, practice working with a reader before the show until you can ride the test paying attention to your horse instead of your reader. Practice your pattern or test backwards and forwards (you can do this walking on the ground and avoid drilling your horse to the point of boredom or rebellion) so that you will not stress about remembering it on the day of the show. Know yourself and what it takes to keep you relaxed. Do you need some time alone before a class? Does it help to have a trainer or friend give you a pre-ride pep talk? Do you need to write down and follow a pre-ride time schedule so you know just when your classes are, how much time you have between them, and how you will use that time to un-tack, re-tack, groom, bathe, etc.? Can you delegate some tasks to a friend in order to carve out pre-class time for you 'get in the zone' protocol? 8. Ride at a level where you are comfortable and confident. Just as it helps reduce the horse's stress to show at a level below the level he is working at home, the same is true for riders. I see many riders whose showing ambitions are beyond the level they are riding. If you are not prepared to ride at a particular level, you will be scared and nervous attempting what you do not know how to do. Get the necessary instruction to ride confidently. Trainers sometimes ask their students to ride at a level that may push their comfort zones, but follow your instincts. Do not allow someone else's ambitions to put you into a truly scary or unsafe situation. 9. Identify your goals and reasons for showing. Horse shows are just games people play and there are many reasons for playing. You may show as a way to benchmark your progress as a rider. You may be showing to teach a young horse new skills. Being with horsey friends may be your primary motivation for attending shows. Others may show for personal glory or to build professional credentials. If you have a farm, you may show to sell horses or attract lesson clients. Be clear about your personal goals and aware that other people have other agendas. 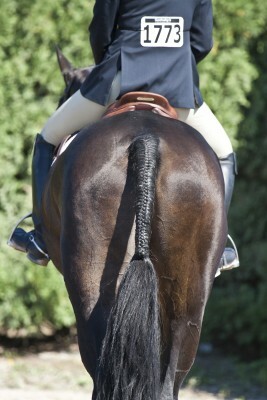 Maintaining a healthy perspective on showing is one of the best ways to tame show jitters. Remember that each show is just one event, one game. Some horse show classes, like jumping or barrel racing, have objective markers for placing contestants. Most, however, are based on descriptions of an 'ideal' that is subject to interpretation. Judges are just human beings and the placement of a class is simply one person's opinion on a given day. Be objective about why you are showing and what your personal goals are regardless of whether or not that means taking a ribbon home. At the end of the day, the best place to be is on the back of a horse. Don't let any one event spoil your enjoyment of your horse. Your turn! Share your favorite tips for managing horse show jitters in the comments below.